Does anyone have a diagram of the vacuum lines for the M117 450 K Jet for the rest of the world models? I've got the vacuum diagrams for both the AU and US models complete with EGR and lots of retard built in. For reference mine is a 1977 model. 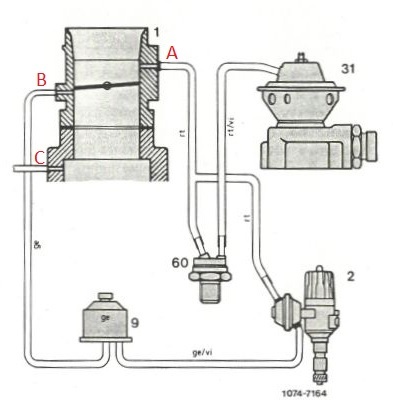 Since the EGR is long since disconnected on my car (and it always uses 95 non-ethanol fuel) I am trying to fix some of the broken vacuum lines and looking to see how the system would be set up with out it. specifically i am trying to work out? 2) does the vac advance plug into the vac source above or below the throttle butterfly? As far as I know there are three sources, two above and one below. I gather the non-smog engines have the unused sources capped. It seems that if you don't care about idle emissions you wouldn't need the retard function and the advance function would be plugged in below the throttle, not above it like in the smog system. A very simple system may no vac retard at all and a single advance line going via a thermal valve to the vacuum advance on the distributor. 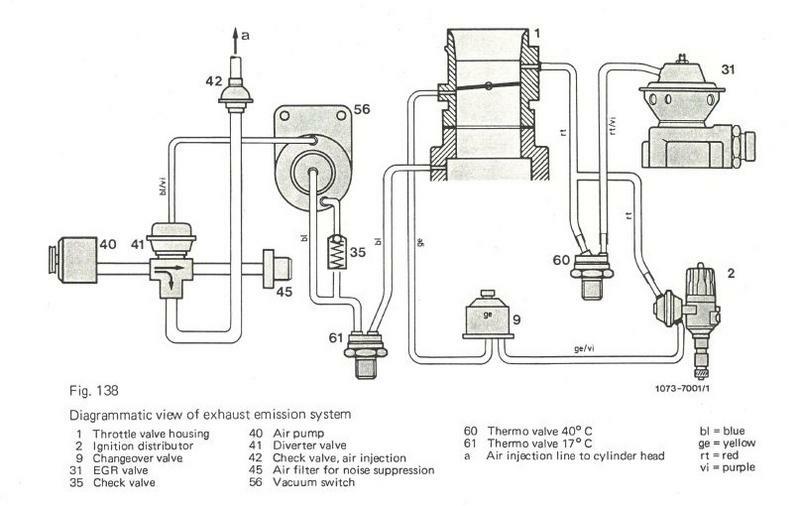 For reference this is the vacuum diagram for the australian version, for model year 1977. To add further, I am also trying to work out in the diagram I have annotated, what is plugged in where on the regular K-Jet 450. B is vacuum retard, which is max at idle and then turns off after idle. C is air pump, which is unaffected by the throttle butterfly. I am not sure where various stuff is plugged in on the regular car. Bryce , I think you will get a better result with 10/11% static advance using 98 octane fuel. Though the total mechanical advance is the important number. somewhere in the low thirties and up to 35 % if the engine is relatively carbon free in all the combustion chambers. Sometimes one cylinder has a build up of carbon and it will cause pinging. Thanks - right now I have 95 in the tank, and as of now the vac advance is plugged in to port A on my diagram, I have not connected up the vac retard and I tried advancing the timing a few degrees. This was fine under load, but it pinged at cruise, probably because of the vac advance. I have put it back a bit, but not yet taken the car for a test drive, and I want to use up more of the 95 before I try a tank of 98 so I get the full benefit. I need to find some caps to cap off the ports for EGR and Air pump as these were disconnected years ago but the lines left uncapped. Good..... now you know where you stand.. if 98 sorts the light pinging the timing is spot on.